LEOPARD-PRINT NEVER LOOKED SO GOOD! 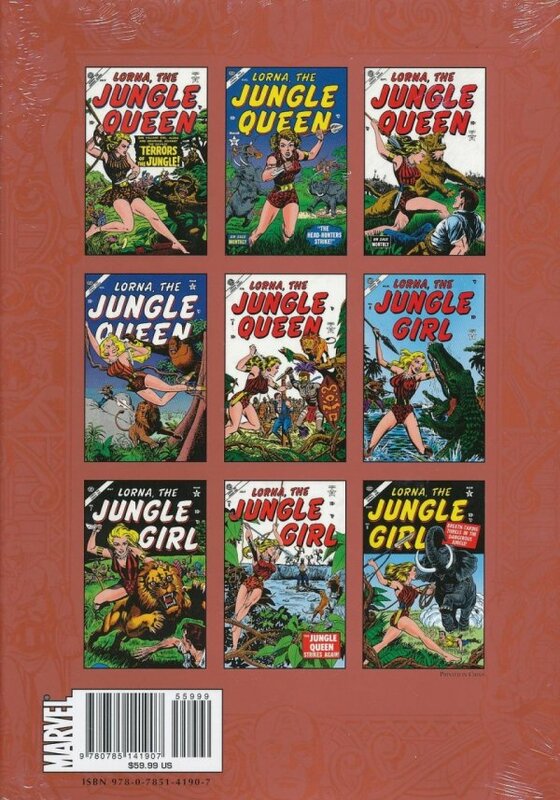 Beginning the complete collection of Atlas' action-packed 1950s jungle adventure comics, the Marvel Masterworks venture into the oh, so attractive heart of darkness to meet Lorna, the Jungle Queen! Her jungle-faring father mauled by a lion, the seventeen-year-old Lorna embraces her unexpected new home - becoming a fierce and stunning girl of the wild and the last word in jungle justice! Trained in the ways of the African wilderness by her mentor, M'Tuba, Lorna is joined by her ever-helpful monkey companion, Mikki, and the bold, two-fisted hunter, Greg Knight. From the murky Black Swamp to the Dead Lake, the pre-Code adventures of Lorna and her cast of characters find them pitted against vicious headhunters, voodoo priestesses, killer cavemen from the Lost City, and Agu the Giant-a gorilla that could give King Kong a run for his money! You'll also enjoy the tale of two Lornas and stalk creatures both strange and fierce as Lorna uncovers all the mysteries of the jungle. With lush artwork by Werner Roth at his career best, forget it, this is a jungle adventure from which there's no coming back. Get ready to go wild with ATLAS ERA JUNGLE ADVENTURES MASTERWORKS!